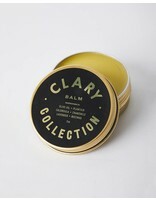 Clary Balm formulated using olive oil with calendula, chamomile, lavendar, and plantain combined which beeswax. Soothes and nourishes lips and skin. Ingredients are certified organic.